Успех самолетов COA и OL в Армии и ВМС США подвигнул компанию "Loening" на разработку их гражданского пассажирского варианта. Прототип Wasp Amphibian был не более чем гражданским вариантом санитарных самолетов XHL-1 ВМС США. Построили единственный опытный ДальшеMore>>> самолет, выполнивший первый полет в 1927 году. В 1928 году был выпущен первый самолет в этом семействе, названном Loening Air Yacht. Под управлением одного летчика машина могла перевозить шесть пассажиров. На самолете установили мотор Pratt & Whitney Hornet. Существовал другой вариант Air Yacht, отличавшийся только установленным мотором Wright Cyclone мощностью 500 л.с. В конце года собрали еще два варианта - Air Yacht C2H и Air Yacht C2C с моторами, соответственно, Pratt & Whitney Hornet и Wright Cyclone. Завершающим гражданским вариантом стал Air Yacht K-85, построенный в начале 1931 года после объединения компаний "Keystone" и "Loening". Самолет спроектировали конструкторы компании "Loening". Его аэродинамику улучшили, отказавшись от центрального поплавка в пользу корпуса по типу летающей лодки. Самолет вмещал одного летчика и семь пассажиров. Амфибийность машине обеспечивали две убираемые механически колесные опоры шасси. Силовая установка включала один мотор Wright Cyclone мощностью 525 л.с., установленный на передней части верхнего крыла. Количество построенных самолетов неизвестно, но оно не было большим. В 1931 году самолет продавался по цене 30000 долларов за машину. IN our issue for December 22, 1927, we published a detailed description, with illustrations and general arrangement drawings, of the Loening OL-8 amphibian, a successful U.S. Service machine of somewhat original design produced by Grover Loening - one of the pioneer designers of America. This week we are able to give some particulars of an interesting development of this machine for commercial purposes we believe the first serious effort by the Loening Aeronautical Corp. of New York at a non-service type. The Loening Cabin Amphibian, with 425 h.p. Pratt and Whitney "Wasp" engine, is developed directly from the standard service OL-8 type referred to above, the only material change being the modification for the cabin at the rear of the wings, seating four to six passengers and including a small lavatory. This cabin is fitted up with swivel armchairs, electric lights, Triplex windows, baggage compartments, magazine and buffet racks, and smoking equipment, in a character equal to that obtaining in the finest motor car or motor boat. One of the most interesting features of the cabin arrangement is that, owing to the widening out back of the pilot's cockpit, there is obtained a direct forward visibility for the passengers despite the fact that the 'plane is of the normal tractor biplane type. This cabin is over 6 ft. long by 4 ft. wide, and has a 60-in. head room, thus affording ample space in which to walk about. It is beautifully upholstered in natural saddle leather trimming, with buff cloth and buff carpet, suggesting the interior of a high-class club car with extreme simplicity and refinement, and yet with no willful waste in weight or sacrifice of easy access for serviceability. 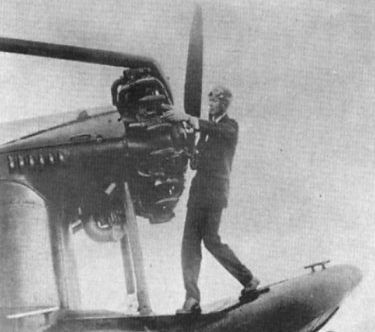 The Pratt and Whitney "Wasp" engine, mounted at the nose with exactly the same installation as the OL-8, drives a 9-ft. three-bladed standard steel airscrew, and is installed with all of the latest equipment, such as automatic fire extinguisher, oil strainer, electric inertia starter, and generator. The silencer employed on this machine is another item of equipment of great importance. A very large size manifold, giving ample expansion space for the gases, collects the exhaust and carries it over the top wing, where it is delivered to the Venturi type muffler, which has been specially developed by the Loening engineers. It consists of a large single expansion and whirling chamber instead of the smaller ones on each side, which have been experimented with heretofore. The pilot's cockpit, located immediately behind the engine and in front of the lower wings, provides particularly good visibility for landing and operating on the water, and is situated in a handy way for all servicing operations, such as fuelling-up, anchoring, mooring, etc. Just behind the pilot's seat is a window which may be opened and thus permit of direct communication with the cabin during flight, although the pilot's compartment - following what is now accepted as the best practice - is made entirely independent of the cabin. The wing structure of this cabin machine is of normal staggered biplane type, 45 ft. span, 6 ft. chord, and 500 sq. ft. in area. As in all Loening amphibians, the spars are of wood and the ribs are of metal, specially treated for preservation against corrosion. The wing-section employed is the Loening 10A, which has proved by tests to be extremely efficient for a thin wing section, very stable and with exceptional lateral control characteristics. An adjustable stabiliser, controlled by a wheel in the pilot's cockpit, is provided, as in the OL-8. The ailerons, which are unbalanced, are fitted on the lower planes only. The main petrol tank is carried in the hull and equipped with a reserve capacity. The tank is readily removable through the side of the hull by a specially constructed side plate in the hull that may be taken on and off with ease. Another one of the features of this machine that has been proved out by long use in service, and many thousands of miles of flying with previous Loenings, is the petrol system. In this the engine pump draws the petrol direct from the main tank, but, in addition, there is provided a hand wobble pump readily operated by the pilot which can be used in case of emergency. No gravity tank is used, and no complications introduced into the system, as it has been found that this dual petrol pump system is by far the most reliable, the easiest to maintain, and the most foolproof. A hydrostatic petrol gauge is provided on the dashboard. The landing gear is equipped with large 36-in. wheels, and 8-in. tyres, which, for a 'plane of this light weight, gives ample excess oversize for operation in the muddiest of fields. Wheel brakes may be mounted, if desired, although the action of the resistance of the hull itself in landing has been found to slow up the run of the machine so as to permit landings to be made in very small fields. The operation of this landing gear and its design is exactly the same as has been developed - with considerable success - in the OL-8 and other models. Similarly, the tail skid is a simple, sturdy construction that has gone through extensive service development, and consists of a heavy steel tube pivoted at the front, with rubber disc shock absorber unit at the centre and housed in a reinforced shell, which, itself, can take the entire tail load at the rear. It may be pointed out that the tail skid forms one of the most difficult problems in an amphibian, but this has been very' satisfactorily solved and tested out in the new Loening amphibians. As regards other constructional details of the Loening Cabin Amphibian, we would refer our readers to our description of the OL-8 model previously mentioned. It will suffice for the present if we outline, in conclusion, the salient features of this original type of amphibian. From the very inception of its development (some four years ago) the Loening unit hull type - an ingenious combination of flying-boat hull and normal tractor-fuselage - has always been an amphibian, logical in its design, convenient and efficient in its layout. As a land 'plane it is sturdy, can be used continuously from inland fields of even small and rough character. The take-off with the air-cooled engine is quick, and the wing loading is light. In actual practice with this type of machine it has been found that there is ample ground clearance of the keel; in fact, the keel itself is sufficiently reinforced to enable landings being made with the wheels up without injury to the 'plane. As a land 'plane, in other words, the Loening claims equal advantages and efficiency to the normal tractor-fuselage type of machine. Then, as a seaplane, the Loening has proved equally satisfactory, even under the most difficult conditions. The hull has been made very strong and serviceable, with its special composite wood and metal-covered construction, and with the watertight nose there is little possibility of shipping water in breaking seas, as in the pusher-type flying-boat. The airscrew in front rises well clear of the water when under way, and is far ahead of the spray, as well as being protected by the hull beneath it. This tractor arrangement has been found to be, in actual practice, a desirable one in every way, comparing very favourably with pusher-type flying-boats. Mooring the Loening prevents little difficulty; upon coming to a mooring the forward position of the pilot enables him to pick up a line, either from his seat or from the lower wing, and with the airscrew still running this line is recessed to a side chock. As soon as the engine is stopped this line can, if desired, be transferred to the bow. With the line at the side chocks the pilot is able to start his engine and warm it up before casting off, and can cast off the line or raise his anchor without difficulty with the engine running. Passengers can be taken aboard at the bow - with the airscrew at rest - and have access to the cabin with steps that are provided, in quite as easy a manner as any other type of machine. As regards airworthiness, the Loening amphibian is stable in rough air, handy and normal on all controls, and easy to land and taxi. Its performance is 120 m.p.h. high speed, 14,000 ft. ceiling, and 50 m.p.h. landing speed, with a complete fuel load of 140 gals, of petrol and 12 gals, of oil, pilot and marine equipment and 1,200 lbs. of pay load. This is considerably higher than is generally carried on "Wasp" engined seaplanes, but makes the total weight of the 'plane in the air only 5,800 lbs., which is within the total weight limit of full, loads that have been carried with entire success on the service types of Loening amphibians with the same horse-power. O.A. length 34 ft. 8 1/2 in. Height (wheels down) 13 ft. 2 in. Gap 5 ft. 11 1/4 in. Area of main planes 504 sq. ft.
Aera fin 15-8 sq. ft.
A MILLIONAIRE'S CHOICE: Mr. Marshall Field's Loening amphibian in which he and his bride (formerly Mrs. Dudley Coats) are making a honeymoon tour. Ранние Air Yacht (подобно этому COA-1) сохранили типичную для фирмы "Loening" конструкцию, прозванную "Shoehorn" ("рожок для обуви"). Поздние Air Yacht проектировались уже как летающие лодки. THE LOENING CABIN AMPHIBIAN: Three-quarter front view of the machine on the water. It is the commercial development of the Loening OL-8. THE CHICAGO AERO EXPOSITION: One of representative types of aircraft out of the seventy odd on view - (3) Keystone-Loening Amphibian Air Yacht (500 h.p. Wright "Cyclone"). At the Detroit Show: The Loening 4-passenger amphibian is engined by a Pratt and Witney Wasp. THE AERIAL 'BUS: The Loening amphibian, which is employed on the "Air Ferry" services operated in America. 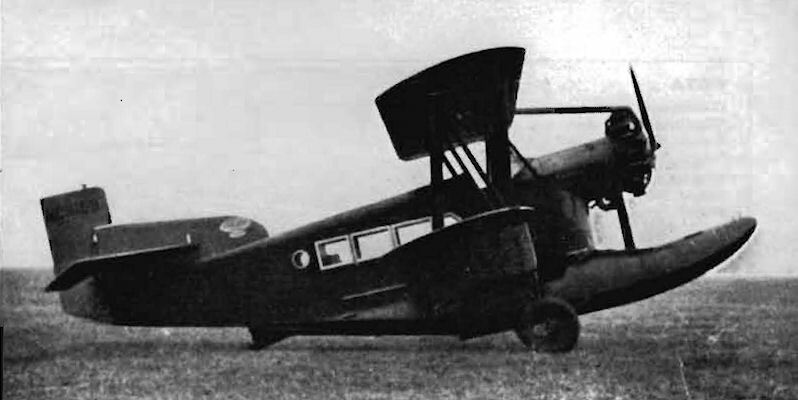 A Loening amphibian used on the Shanghai-Hankow service. THE LOENING CABIN AMPHIBIAN: Side elevation, showing hr greater detail the general layout of the hull and cabin. 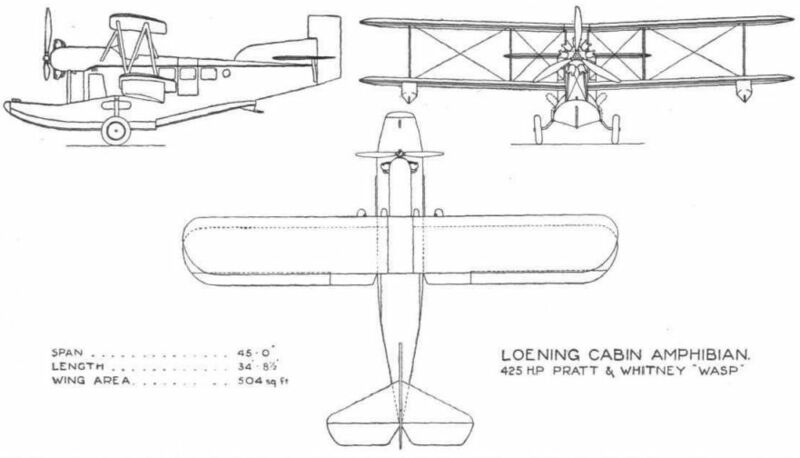 Loening Cabin Amphibian 425 hp Pratt & Whitney "Wasp"